United Airlines (UAL) shares plummeted after an old news story about the group filing for bankruptcy protection mistakenly resurfaced on the internet. The airline's shares sank 75% to lows of $3 within minutes of news service Bloomberg republishing the report. Only after almost $1bn was wiped off the firm's market value did investors begin to suspect there was a problem. The article - which set out United's decision to seek protection from creditors - first appeared in 2002. United emerged from bankruptcy protection in 2006 and is currently cutting jobs to offset high fuel costs. The airline has since blamed the South Florida Sun Sentinel's website for the reappearance of an old story from the Chicago Tribune's online archives for the blunder. The story was subsequently picked up by a reporter who supplies Bloomberg. Tribune Co - which owns both the South Florida Sun Sentinel and the Chicago Tribune - later issued a statement saying the story was clearly in the website's archive section and hinted that the reporter had not read the article properly. "The story contains information that would clearly lead a reader to the conclusion that it was related to events in 2002. In addition, the comments posted along with the story are dated 2002," Tribune said. United Airlines shares nosedived soon after the report was released and the Nasdaq stock exchange halted trading in its shares. In the wake of the slide, the United released a statement demanding the Sun Sentinel retract the report - adding that while it was battling against spiralling fuel costs and cutting 7,000 jobs it was not bankrupt. 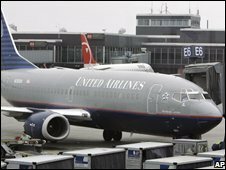 "United continues to execute its previously announced business plan to successfully navigate through an environment marked by volatile fuel prices and continues to have strong liquidity," the group added. However, investors who sold their stock in the wake of the report cannot expect any compensation as the Nasdaq said any trades triggered by the erroneous report would not be rescinded. The airline industry has been battling through turbulent times as rising oil prices have forced up fuel costs and passenger numbers have fallen, factors which made the United Airline story all the more believable. In response many carriers have cut routes, raised prices and axed staff. In the second quarter of the year United Airlines posted a $2.7bn loss - partly as a result of fuel costs rising by $733m.